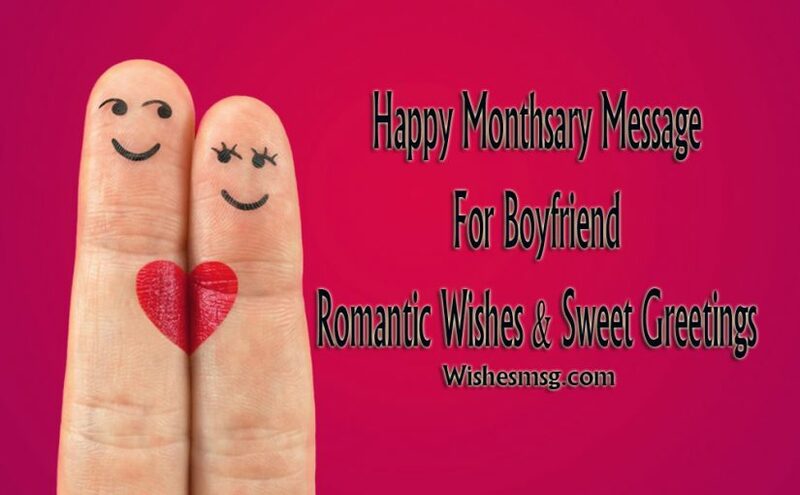 Happy Monthsary Message For Boyfriend along with romantic and sweet greetings which will be a great way to celebrate your love relationship monthly. There is a saying that girls care most to their boyfriend. They often make a wish first to celebrate any kind of occasions. 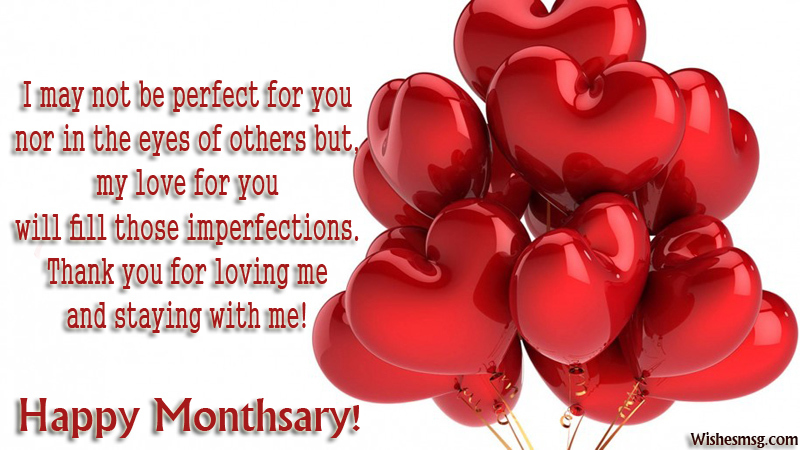 So, here we glad to share these best happy monthsary messages for your beloved boyfriend. 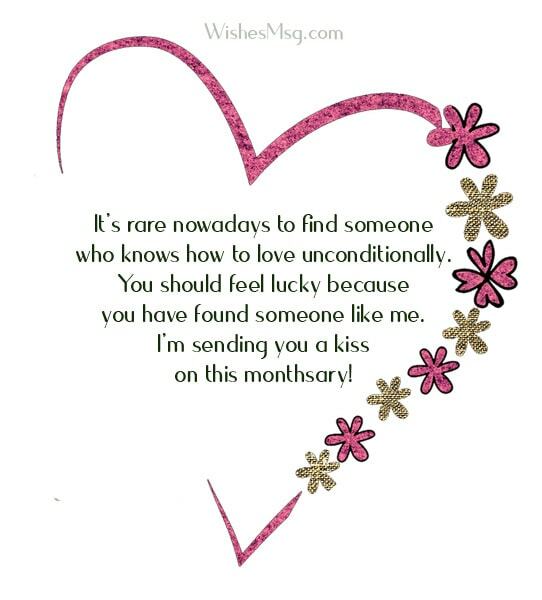 Send a romantic monthsary message in a text to make him surprise or give him a cute note writing sweet loving quotes on it. Never stay back to show how much you care for your relationship and love. No matter what it’s your 1st, 2nd or 3rd monthsary, this moment is enough to celebrate your love. You kept doing terrible injustice with me for the entire month. You have stolen sleep from my eyes & replaced that with daydreaming. You have to pay for this the next time we meet. Happy monthsary! If you think that I’m the nicest girlfriend because I treated you nice in the last month, don’t be a fool. You have just seen the girlfriend version, not the wife version of me. Happy monthsary anyway! It’s rare nowadays to find someone who knows how to love unconditionally. You should feel lucky because you have found someone like me. I’m sending you a kiss on this monthsary! I’m going to file a case against you because you have stolen my heart & Kept it with you for yet another month. Do you know what’s the compensation for this crime? You have to spend your whole life with me. I am so glad that one more month has passed with the stupidest and unromantic boyfriend in this world. But I’m equally sad because I have to spend another thousand months with you. No way! As long as I know you’ll always be my side, there will never be any reason for me to cry, Our Love makes us happy. Happy Monthsary! Happy Monthsary! Nothing more compare the happiness I felt for this moment having someone like you in my life. Thanks be to God! Yes I said that, because your one of a kind, I’m glad and will always feel blessed for having you in my life. Today is an awesome day to acknowledge how awesome it is to have you in my life. Happy Monthsary baby. I just want you to know that I will never get tired of loving you. Sweet monthsary dear. Minutes turn into hours, hours into days and days into months. And each and every moment of those is very special indeed. And today as we celebrate another month of our love I feel very blessed indeed. Happy Monthsary to you my beloved. Being with me is not so easy but you do it every day, so thank you for being so cool and here’s wishing you a very happy monthsary, I love you sweety pie. I feel a special charm when I’m with you, I like to be with you because you motivate me to fight and overcome the difficulties that arise, you give me the strength I need to face life. God has got his own reasons for us to meet and come this far. But I hope our love will flourish beyond what it is right now. Every thirty days my life’s battery gets a new charge in life because of you. Happy Monthsary my darling. Distance cannot keep us apart anymore us because our hearts are bonded in a heavenly relation. Many more months will go like this one but our love will only be stronger day by day! Nothing can make me realize that you are not with me, that you are so far away from me. Because, whenever I close my eyes, I can feel you right beside me. Happy Monthsary! Time will fly, people will change and colors of life will disappear. But one thing will remain constant. That is my love for you! Happy monthsary dear! Come back soon and give me a hug! I have spent another month without you. I know you feel just as much as sad as I am. Just know that this a sacrifice we both are making for an amazing future together. I love you and miss you a lot! My days are not colorful because you are not here with me. But my dreams are always colorful because you are always in my dream. Happy monthsary dear! I’m waiting for you to come back! Miles can apart us in distance of places but in our heart, the feelings are the same. I treasure you in my heart and I will never trade you in exchange of million dollars nor miles. Love you handsome! We love, we care and we feel for each other even though many miles separate us but our hearts will never apart. We will be the best love couple forever. Happy Monthsary! Don’t measure the distance by the length of meter or miles but in terms of our hearts. It is far away but not by heart. You and I always be the best pair who made for each other. I love you! Without you, sometimes I feel bored and your absence causes pain to my heart. And after that, I feel very lucky to have someone so special like you to miss. Thinking of you on our monthsary! No matter how many miles and the ocean separates us only by distance. They will never ever able to separate us by heart and lessen our care for each other. Just missing you too much! I love you! I wish I could stop the flow of time so every day with you would last like a year. I can’t believe we spent our first month together. Really, time flies so fast when we are happy. Dear beloved boyfriend, I know you are just as happy as I am. We have just spent the first month in our relationship. I wish to spend another thousand months with you! I don’t remember one more month of life which gave me this much happiness. Thanks for coming into my life. Happy first month anniversary dear. I love you so much! As the most romantic month in our life waves us goodbye today, I want to say that this is just the beginning of our everlasting bond. Many more awesome moments are coming in the next following months! The day is just as much bright as it was when we started our journey together. These wonderful colors of nature are reminding me of the sweet memories we shared in our first month together! I love you! Yey! We did it! We lasted a month. Happy first-month Boo 🙂 I hope in the future we could turn months into years. Happy 1st monthsary! Thirty days have passed in which I have come to know that I have found a very special treasure. I cherish every moment and day spent with you my love. Happy Monthsary to you darling. You make me the happiest girl in the world, and can always make me laugh or smile whatever you do. You could probably make me cry as well, but I hope that it won’t happen. My greatest moments are those spent with you, and our best days are yet to come. As we celebrate a milestone in our journey of love may we truly know that we are blessed. Happy 1st Monthsary my darling. I thought dreams don’t come true but then I met you and fell in love with you. It’s been a month since I have been this lucky enough. Happy 1st monthsary. You’re my knight in shining armor, the man who has managed to capture every detail and do want nothing more than to have you with me, I love you with all my heart. Like roses our love blooms and there are no sorrows and glooms, like a flowing river our love is endless and let’s celebrate our monthsary of togetherness. Love you. Once upon a time, something happened to me it was the sweetest thing that ever could be. A fantasy, a dream come true… It was the day I met you! I Love You and Happy Monthsary to you! We planted a tree and every day we must water it, and every thirty days we must prune it so it can flourish. May our tree of love grow strong and sturdy and give us joy for many months to come. Happy Monthsary. I couldn’t resist the opportunity to tell you how happy I am that we have completed so many months of togetherness. Happy monthsary. You are the love of my life, and despite the difficulties we have, all I want is to stay with you forever. Feeling your kiss makes me feel a sweet magic that comes over me. Now I know what does it feels to fall in love. I may not be perfect for you nor in the eyes of others but, my love for you will fill those imperfections. Thank you for loving me and staying with me! I am delighted to be your girlfriend, there are almost no men like you, thanks for all that you give to me, every gesture of yours tells me that your love for me is real. I will protect our relationship it may never end. There have been so many ups and downs but you never left the side of me. Love you to the core. Happy monthsary. Thank you for the Happiness that you always gave to me, and for those moments and times that we always shared our thoughts. Thank you for everything’s. For the past twenty-nine days our love has been smoldering. Today is the day to make it burst into flames. Happy Monthsary my love. There are those moments in my life that I’ll always remember. Not because they were important, but because you were there with me. Happy monthsary baby! I will always be yours no matter what the world turns out to be. My heart will always be yearning for your love and care forever. I love you always. Every second I’m with you I feel complete, and when you embrace me, I feel that our souls become one. I will never stop loving you because you’re the man I always dreamed of. You changed my life and taught me the real meaning of true love and care. You are the world to me. Happy monthsary to you. To be perfectly honest YOU MEAN EVERYTHING TO ME! When I first met you, I honestly didn’t know you were gonna be this important to me. Happy monthsary sweetheart! Don’t let the romantic moment flow in vain. Make your boyfriend feel the luckiest guy and show your unbound love to him and keep your relationship evergreen.